Remember, remember the 5th of November. 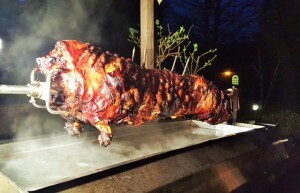 Our team at Hog Roast Alexandria could never forget Bonfire Night as it is such a popular time for our customers to book us in for a feast to serve to them and their guests. You may know it as Fireworks Night, but either way, this particular day of the year is where November starts to shine, with amazing firework displays lighting up the skies and the smell of bonfires everywhere. There’s one thing that smells even better than bonfires this month of the year and that’s one of our gorgeous hog roasts, and for a Bonfire Night party that we catered locally, the air was full of meaty aromas wafting around, tempting the guests to go back for more. Justin called us a few months ago to make sure that we could cater this day of the year, as it can get very busy. He wanted a party to celebrate both Bonfire Night and his wife’s birthday, which happen to be on the same day, and for us to cook her favourite food of a lovely hog roast. With 50 guests for Janet’s 50th milestone, Hog Roast Alexandria would be preparing, cooking and serving a medium-sized hog, together with seasonal vegetables, new potatoes, and our onion gravy, and of course alongside our own homemade apple sauce and stuffing. We’ve spent many years making sure that we can feed all of our customers and their guests, so when Justin asked if we could provide a vegetarian option, we gave him a list of all the possible options and he chose our popular veggie skewers. With fresh halloumi and vegetables, they go down a treat with our vegetarian guests, can be made vegan if needed, and are also enjoyed by carnivores too. On the day of the party, on Bonfire Night itself, Hog Roast Alexandria headed to the local hotel venue and set up in the gardens where we could thankfully feel the heat of their bonfire on this cold night. By 7pm, the fireworks were already in full swing and we had roasted a hog and grilled the skewers to perfection, the vegetables and potatoes were ready to serve and we invited the guests to queue up for a truly tasty meal.